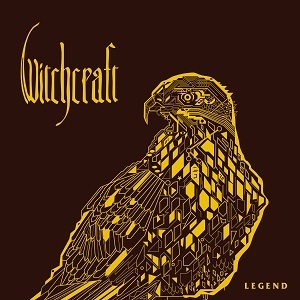 It's been five years since Witchcraft released their last album (The Alchemist). Since then they've had a major change in lineup - losing two members and recruiting three new ones (the extra recruit being a second guitarist so guitarist/singer Magnus Pelander is able to drop his guitar duties and focus purely on singing). They've also switched record labels and are now with Nuclear Blast. They've got a very 1970's hard rock sound with a definite Black Sabbath influence. Brief comments on a couple of tracks. Clocking in at over twelve minutes, "Dead end" feels like it's never going to end - it really does drag I'm afraid. The guitar sound on this album is key to that 1970s hard rock or Black Sabbath feel, but there is plenty of bass showing here too. The drums are good, and the vocals work well - Magnus Pelander giving up the guitar may not make much difference in recording the album, but I'm sure it will help them step up a notch with their live performances. This is a good album - but for me it's lacking that spark that would turn it into a great album. There's nothing wrong with it, but its that intangible magic that is needed. Rival Sons have a similarly 1970s hard rock sound but have that spark and have produced an amazing album with their latest release, and for me that puts this new release from Witchcraft in the shade. If you like Black Sabbath and 1970s hard rock then this is an album you should certainly listen to.